We are very pleased that our Mainnet launch was successful and went ahead as planned without any issues. Progress during the last weeks leading up to it was solid, as evidenced by the month-over-month chart below. We completed the remaining 8% of the work in just over two weeks. The burndown chart is a satisfying testament to the great work the team accomplished to complete our work on the Mainnet milestone well before the end of 2018, an internal goal we had set for ourselves. Our engineering team has done exceptional work and delivered a robust implementation of the Po.et protocol that will reliably handle a sizable amount of use from our community and the partners we look forward to on-boarding in 2019. We’ve done some load testing to push everything forward and will look to publish results at some point. 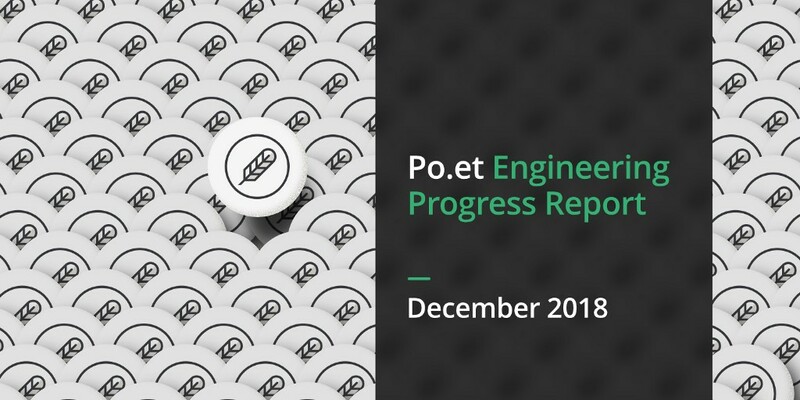 As we mentioned in last month’s report, the foundation of Po.et has now been shipped and will allow us to iterate much more quickly from here on out.